100% natural and 100% organic and climate neutral care and well-being products without any synthetic dyes, fragrances, preservatives and other additives. 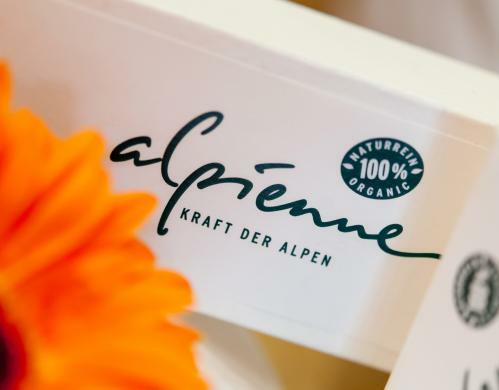 The products from Alpienne are based on pure olive oil, lanolin, beeswax and propolis with ingredients of wild herbs. Choose your preferred treatment: back & neck massage, head & face massage or a legs sports massage. This relaxing full body massage alleviate pent-up tension throughout the nervous system. Steam-warmed herbal stamps and St. John‘s Wort massage oil are combined in this treatment to relax the whole body. An excellent antidote to tiredness, sleep issues and nervous disorders. Relax muscles with the sport and vital body pack followed by an Alpienne back massage.